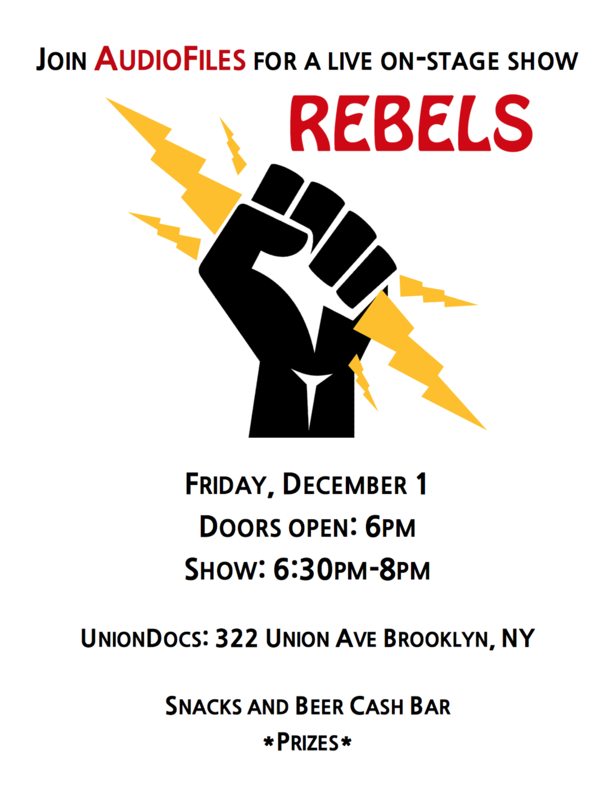 The CUNY Graduate School of Journalism’s AudioFiles team invites you to join us at Union Docs (322 Union Avenue, Brooklyn, NY) for a LIVE taping of our final episode of the season. The theme is REBELS. The evening will be packed with great stories including personal accounts of rebelling against parents and the history of the NYC drag scene. There will also be comedy, music and a game show with prizes! Plus there will be a cash bar for beer, wine and water. Doors open at 6pm. Also, tell us about your most rebellious moment … and you could end up in the show! We want to hear about your terrible two’s, your teen years or rebellions in your 30s or 70s. Email us at [email protected].edu and be sure to leave a phone number so we can call you. Or leave us your story in a voicemail at 845-481-0642. And send us your most rebellious moment captured in a photo (please keep it PG!) to the email above.